How do you get a teenager to clean their room? Excellent question and we're going to talk about that today. Hi there, I'm Angela Brown and this is Ask a House Cleaner. and I get to help you find an answer. Now, this show is brought to you by my MyCleaningConnection.com. In the resource section, we have a whole section on cleaning for kids and teenagers. 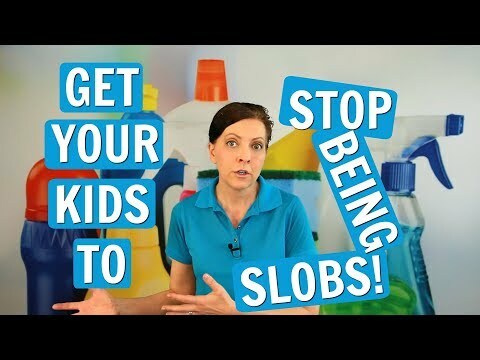 we did the other day, on how to get kids to clean. that we shared with you. It was on my data versus your data. Because people will argue with your data, but they will never with their own. a clean room look like to you? And have them give you their data. Once they give you their data, now you have some information to go from. or you can add on to that. Now, together, you can come up with what a clean room is. do you understand, do you agree? things that are going to inspire a teenager that are not blue ribbons. or what have you, but instead of getting cash, it's easy to work a point system. A point system in their head is not the same as dollars. Each point is worth so many dollars so you might say 10 points equals $1. I'm using this in U.S. terms. It's going to be different from euros or peso's, or pounds, or whatever your currency is. Let's say one dollar equals 10 points, so then you place a value on everything. If you make your bed, that is worth five points. If you clean up the vanity around where you brush your teeth, that is worth five points. that is worth five points. tally of the different points that your child has earned. Now, what happens is, if they misbehave. or whatever it is, then points are deducted. You can have earning points and you can points taken away. Now, when they go to buy something, you buy those with the points. Let's see how many points you have, which equals so many dollars. because you don't have enough points to go. They don't take care of it. the whole computer, or you have to replace the screen. Or, they lose the remote control on the TV, whatever. They don't take care of stuff because there's no value in it. going to start keeping track of the points. You will too, but suddenly, everything has a value. of the things that they have. floor where it gets stepped on. they paid 250 points for it. entitled to receive stuff for free. As a result, they have to earn what they have. and you're going to be adding points. Little things, like picking up all the toys, equals five points. That's five more points that they didn't have a minutes ago. could rack up 100 points very quickly. points, but also that those points are redeemable for something. because you love your kid and you provide for your kid. I'm old enough to drive a car, can you buy me a car?" "I don't know, let's see how many points you have." "Oh my goodness, how many points? You mean I got to earn the car, too?" their points toward a vehicle. they're going to take care of it. they're not going to get all kinds of junk in it. They're going to vacuum it out, they're going to take it down to the carwash. I mean, they're going to take care of the vehicle because they had to pay for it. The same goes with their college education. being drunk at parties, suddenly they had to earn this. it's a whole different ballgame, because they value that. got to do nothing in exchange. lives with you, how to clean up after themselves. that are of value to that person. All righty, that's my two cents for today. leave the world a cleaner place than when you found it.